If you answer yes to any of the following questions, you should consider using GIS topology rules to check to validate and fix errors in your GIS data. Do unwanted gaps exist in your data? Should lines touch the boundary of polygons? TOPOLOGY is a set of rules how points, lines and polygons share their geometry. Topology checks and validates the spatial relationship of neighboring and overlapping features. Analysts often assess data validity using accuracy and precision – which aren’t the same. What’s the difference between accuracy of precision? PRECISION identifies the closeness of two or more measurements to each other. ACCURACY refers to the closeness of a measured value to a known value. Unknowingly, errors can exist in GIS data. You may not even know. How scary is that? That’s why we can fix errors automatically with topology rules. For example, positional accuracy, digitizing error, data generalization and age of data are often sources of data error. 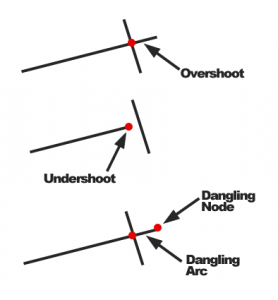 Dangles, overshoots and undershoots are examples of errors. SLIVERS are small, spurious gap often as a result of imprecise digitization of features in GIS. OVERLAPS are polygons or lines that are on top of each other which could result in double-counting areas. Also, when you have two conflicting data sets, conflation (edgematching and rubbersheeting) resolves conflicts by preserving the most accurate one. Topology rules ensures connectivity between GIS datasets. It fills in gaps, removes slivers and fixes overlapping polygons. When polygons share a boundary, topology rules enforce data integrity. …But you already know that. Let’s get into the nuts and bolts of how to use topology in ArcGIS. 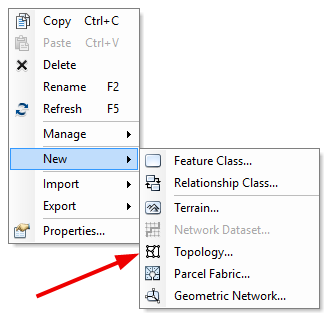 Creating topology rules in ArcGIS is just a couple of simple steps. First, add your data in a feature data set. Once your data is in a geodatabase, you have to create a topology data set. Follow the instructions by selecting your feature class. There are over 30 rules you can add to inspect the quality of your data. One-by-one, you add rules which govern exactly how to perform quality control to your spatial data. Below is a screenshot of adding an overlap rule. Overlapping polygons can be resolved by the topology rule “must not overlap”. Once your data is in a geodatabase and rules have been added, you can now inspect your data topology. ArcGIS topology fixing is interactive. One-by-one, you can go through errors and fix them with the error inspector. Add the topology data set. The errors in your data will appear as area, line and point errors. The ArcGIS topology tools supports richer, complex error checks. Resolve topology issues with automatic or manual fixes. Add the Topology Toolbar by clicking Customize > Toolbars > Topology. If the Topology Toolbar is greyed out, you have to turn on Editing mode by clicking Editor > Start Editing. When you push the error inspector button, you can manually go through each individual error. 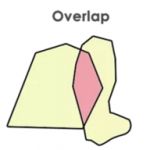 MERGING: The overlapping portion will be subtracted from one polygon and added to the other polygon. SUBTRACT: The overlapping portion will be removed completely from both polygons. CREATE FEATURE: The overlapping portion will be removed completely from both polygons and added as an entirely new features. Using snapping in GIS can prevent errors from happening altogether. The snapping environment determines the distance that newly digitized points, lines and polygons will occupy the same location of existing features. When new features are created in the editor, they will be automatically snapped to existing features. For example, you can snap to edges, points, ends, intersections, midpoints and tangents. When errors exist, topology tools can help… And clean topology is absolutely necessary in GIS. Topology is especially useful for detecting and correcting errors of digitized data because it checks and validates the spatial relationship of neighboring and overlapping features. Topology editing is a strong point in ArcGIS with a ton of options to fix editing errors. It’s really the best of its kind. When you’re creating your topology data set, check the rules to make sure they can be part of the topology. Also, I’ve seen that if you have multiple data sets participating in topology, then sometimes there are issues. I’d suggest simplify with just creating one topology data set with a single feature class. If that works, try adding one more with a simple rule. Finally, if that works, try again to add more feature classes with more topology rules. Thanks, it really helped me a lot.